This is the story of a strike by glaziers working on the construction of the crystal palace for the Great Exhibition. With Chartism’s high tide just three years past, some feared the event would attract foreign revolutionaries bent on subverting British workers with their “socialist eloquence”, as Lord Normanby, the British ambassador to Paris warned the foreign secretary, Lord Palmerston. Others thought Joseph Paxton’s greenhouse design was too insubstantial to withstand a gale, let alone the weight of vast numbers of visitors tramping through its galleries. In the event, none of this came to pass. But at one point, in the late November of 1850, it appeared that a dispute between the building contractor and the hundreds of men employed to fit the massive glass panels of the roof and walls might halt the entire project. The techniques being pioneered in the construction work were unique. Some 300,000 of the largest glass panels ever made, each 49 inches by 12 inches, needed to be slotted into the iron framework within a matter of weeks if the exhibition was to open on time. Glaziers work at height on the “crystal palace” which would host the Great Exhibition of 1851. The work was hard. 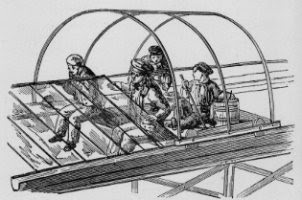 The glass was inserted into prepared grooves from a trolley (pictured), pulled backwards along rails which would later be used as rainwater gutters. Each trolley carried a crew of two men and two boys. The trolleys were covered, so that work could continue in all weathers, and the working day continued long after it had grown dark each evening, their efforts illuminated by vast bonfires of leaves and woodshavings lit in the nave far below. At a meeting of the glaziers on Friday, 22 November, William St Clair declared that the rate for the job – 4 shillings a day provided 58 panes of glass were fitted in that time – was unacceptably low. He argued that it was not possible to fit so many panes without skimping the work, leaving the building prone to leaks or worse. He proposed that the men should demand 5 shillings a day, or 6d and hour, regardless of the number of panes fitted. When this and a demand for longer lunch breaks were put to the site manager, they were rejected, and 30 glaziers walked out on strike. Others on the site demonstrated their support by refusing to gather round the booth where payments were made, instead singing the National Anthem. About 150 men now gathered at the Ennismore Arms public house, just south of Hyde Park, where letters were drawn up to be sent to Charles Fox, senior partner in the construction firm building the palace, and to the Commissioners appointed by the government to oversee the project. In their letter to Fox, the men warned that if their demands were not met they would place an advertisement in daily pappers (then a common tactic in trade disputes) warning the public that the work had been skimped and the building would therefore be unsafe. Fox, however, refused to budge. In a sharp reply, he told the glaziers that they could return to work on his conditions or leave. The following Monday was set for confrontation. The metropolitan police arrived in force at 5am, well before work was due to begin, to ensure that the pickets could not close down the site. All those who had gone on strike were sacked and replaced by other glaziers, and later that day, St Clair himself was arrested and charged with sending a threatening letter. With its leader now in police custody, and the most militant of the glaziers removed from the site, the strike now collapsed and work resumed as normal. The dispute had ended in defeat, but it would not be the last to take place in the building of the Victorian era’s great monuments.